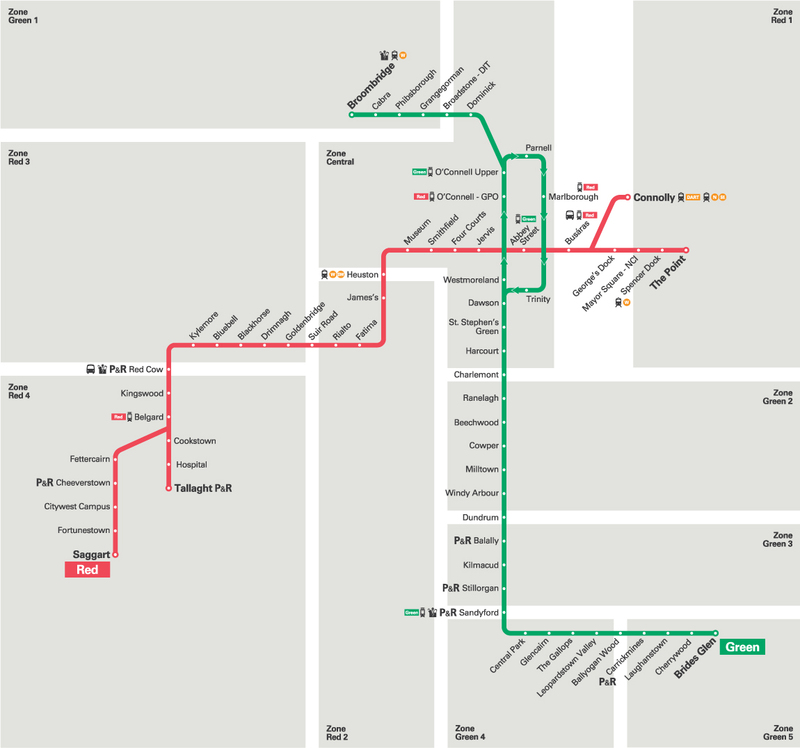 – The Luas Red Line links Tallaght/Saggart to Connolly/The Point via the city centre. – The Luas Green Line links Brides Glen/Sandyford to Broombridge via the city centre. – Both lines have Park + Ride and Cycle + Ride facilities. You can download a map here of the Red and Green Line routes. 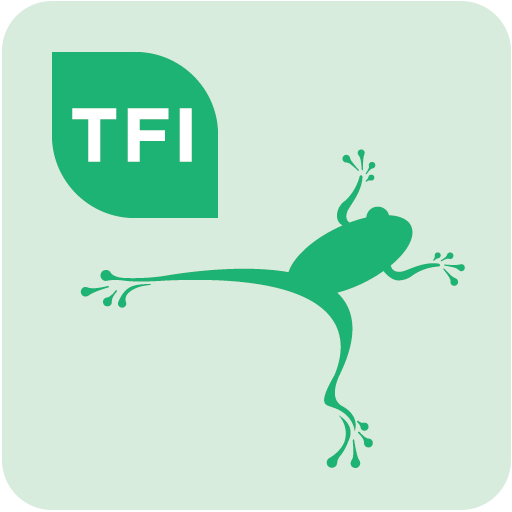 The Real Time Ireland App lets you check when your next Luas service is due. 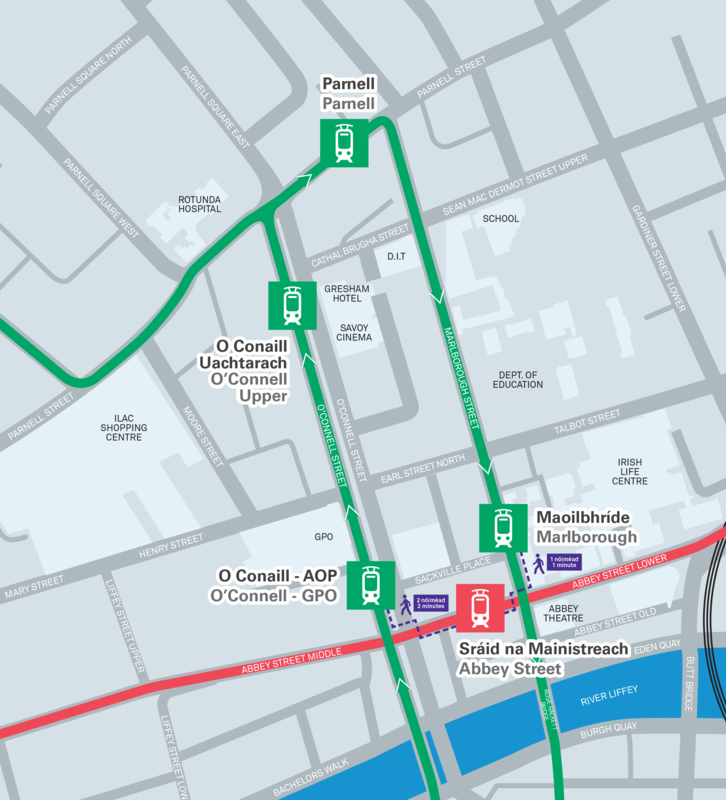 You can now interchange between the two luas lines at stops – Abbey Street, O’Connell GPO and Marlborough Street. This makes for easy access to Saggart, Tallaght, Connolly Station or The Point (3Arena) from the Green Luas Line. This is also useful for passengers on the Red Line as it gives them easy access to Broombridge, Cabra, Phibsborough and all of the Luas Green Line stops out as far as Brides Glen. Passengers on the Red Luas Line can disembark on Abbey Street and walk 1 minute to the Marlborough Street stop and board the Green Line that travels to South Dublin. You can get off the Red Line at the Abbey Street stop and walk 2 minutes to the O’Connell GPO stop and board a Green Line that travels north towards Broombridge. 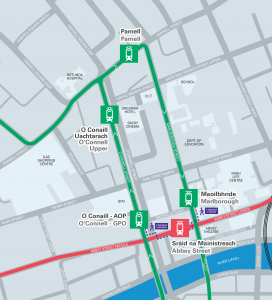 Hop off the Green Line at O’Connell GPO stop, you can walk 2 minutes to Abbey Street and board a Red Line tram heading towards Tallaght or go the opposite direction to Connolly and The Point (3Arena). You can get off the Green Line at Marlborough Street and walk two minutes towards the Abbey Street stop and board a Red Line tram travelling westbound towards Tallaght or eastbound towards The Point.